It's the middle of winter and I've got the mid-winter blues. It's cold, snowy, and grey. I need a little warmth and sunshine in my life right about now. Unfortunately, I won't be sitting on a warm beach until April. 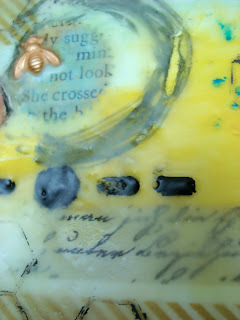 So, as I'm getting over my 4th sinus infection, I decided to play with some new tools and media. I was mesmerized at my annual Art Teacher's Conference in Rochester, NY with a company demo using wax products. Encaustikos had a booth and I was in love at first sight! I bought some basics and pulled out an old skillet that I have long since deemed unusable with food. 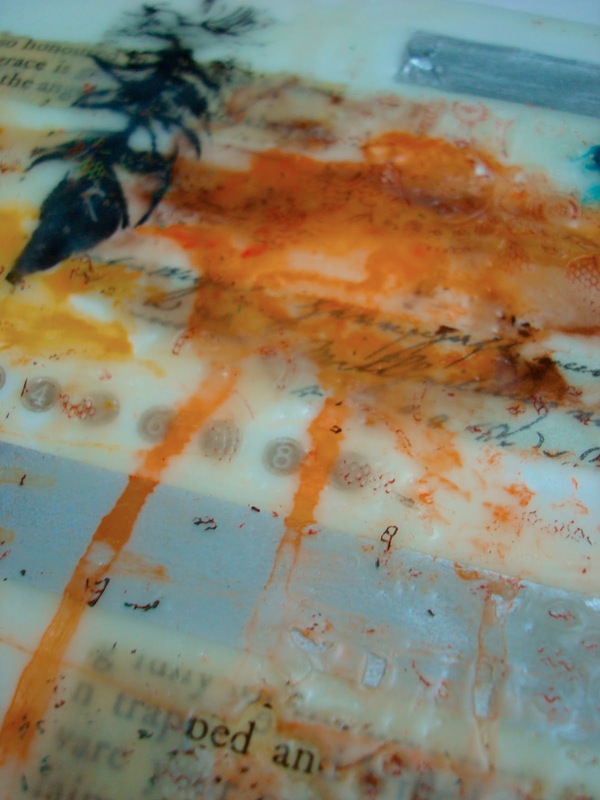 Here are my first 2 artworks using melted wax otherwise called Encaustics. You will be seeing more of this from me soon!!! I might even have an art exhibit using these artworks! My 1st attempt with lots of layers. LOVE! 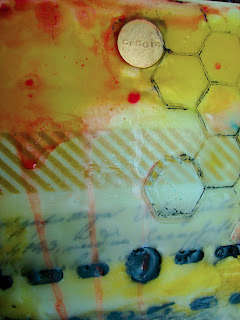 "Disintegration"
Drippy Gelatos on top, washi tape layers and stamping into warm wax. 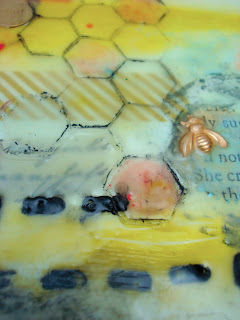 Close up of the bee charm embedded in the wax... stamps, stencils, and Gelatos. 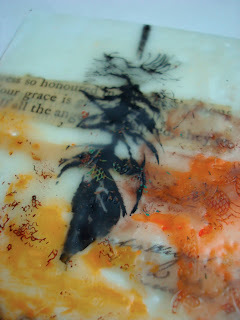 Learning how to control the seperation of inks when heated up. Stencils and wax. 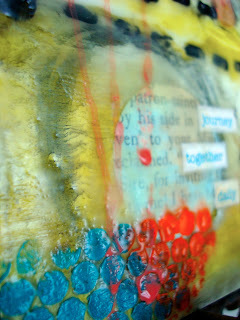 This medium is addictive and I hope I can teach a class using mixed media and encaustic soon! I'll update soon! Several years back, we had a drop in our elementary enrollment and a boon at the high school level, and I was asked to teach a Studio in Art class (we are a k-12 building). Since I started my teaching career in a high school, I was psyched, but worried the big kids would be annoyed about having art class in my elementary art room. So I surprised (and scared) the kids by telling them our first project would be using crayons. 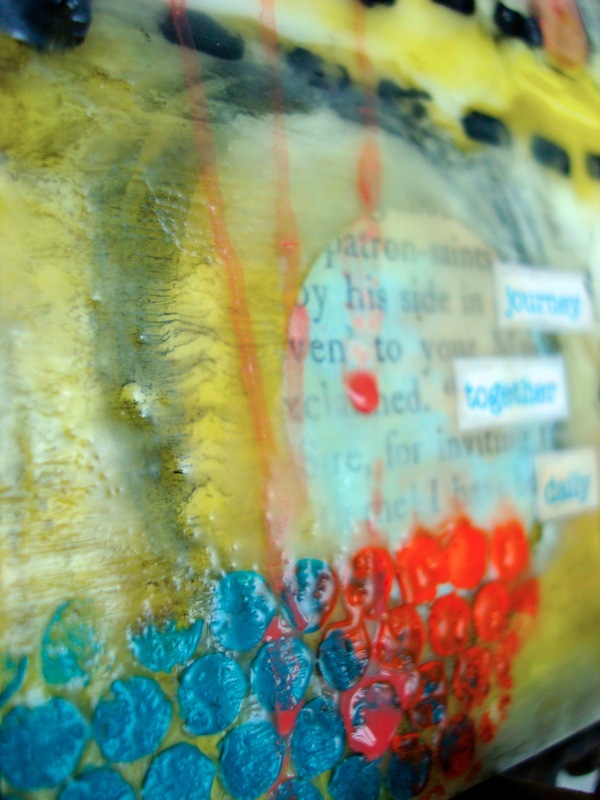 Then we talked about encaustic, and texture, and Impressionism, and the kids each prepainted a piece of heavy cardboard with a base color. We set up candles at all the tables (I don't know my I wasn't fired!) and I gave them all the broken old crayon stumps. The crayons were dipped into the flame, and then used in quick strokes on their boards while the crayon tip was melted. They could build up layers of color, and the resulting work (which I stupidly never photographed) were gorgeous - landscapes, still lifes, abstractions, etc. oh wow! oh Wow! I have been wanting to try using wax and your use of the gelatos with the wax is amazing! I am so pinning this..gorgeous!!! !